Barry Gray says Cliftonville are working towards producing a more complete performance when they take on Linfield at Windsor Park tomorrow. 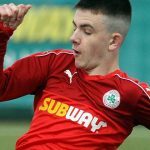 The Reds visit south Belfast at the end of a testing week that started with Danske Bank Premiership defeat to Ballymena United and included League Cup elimination at the hands of Dungannon Swifts – two games in which the Manager was frustrated that his players only performed in fits and starts. “If we took the last couple of weeks and calculated up the time that we’ve spent on and off the field to try and get us into a scenario where the corner we’re trying to turn becomes more narrow, it would be scary,” he explains. “This is a part-time position that I don’t treat as a part-time position. This job is so important to me that I don’t have time to go into work – and the backroom team, including the new staff that have come in recently, are committed to doing as much as we can for the players. “There’s no questioning the team’s ability, but we haven’t performed the way we’ve wanted to consistently enough – it’s been half-an-hour in one game, 45 minutes in another, often when the chips are down. 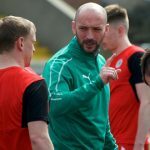 “I’ve said before that we need a big bucket of honesty when the players cross that white line and you’ve got to look at the responsibility we have as a group to every volunteer that runs this Club and spends so many hours working hard for Cliftonville – that’s the hard work that we need to see replicated when the whistle goes. 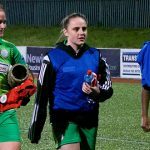 “We’ve deserved the criticism we’ve had to take this week but it hasn’t changed the preparation that has to go forward to the Linfield game. A win would be massive in terms of where we sit in the table at the minute so that is our focus. Regardless of Tuesday’s performance or result, the same prep still has to be done. Linfield are hosting a Foodbank Collection ahead of this fixture and a donations stall will be in operation at the away turnstiles for any Cliftonville fans who would like to contribute. In aid of The Larder in east Belfast, the appeal is on particular lookout for tinned goods (such as fish, meat, fruit, soup, veg, custard and rice), baked beans, tea, coffee, toilet roll, biscuits, pudding, pasta, washing powder, toiletries and washing-up liquid. Your support would be hugely appreciated. 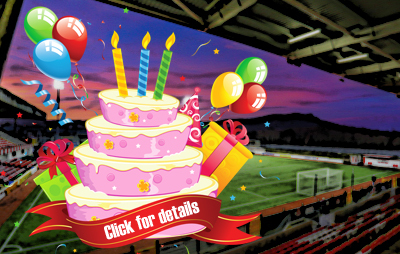 This is an all-ticket fixture for Cliftonville supporters, with final sales taking place from the ticket kiosk at the away turnstiles.